In the Atlantis control room, Dr. Elizabeth Weir and Lt. Colonel John Sheppard observe a M.A.L.P transmission through an open wormhole. The probe has been sent to a world recently discovered in an off-world database. Someone speaks into the camera warning them to stay away if they are up to no good — or to come as friends. Eager to trade with a seemingly advanced civilization, Dr. Weir decides that it is appropriate for her to join the away mission, and gears up. Once through, the team find themselves in an exact duplicate of the Atlantis Gate Room. Turning, they look through the Stargate to see, not a stained glass wall, but a lengthy corridor connecting to an endless city. Intrigued, they wait until approached by a man, Niam. He invites them to come and meet the leader. Unlike Niam, Oberoth is unimpressed and haughty. An offer of trade and a possible alliance is met with immediate rejection. He believes that his people, the Asurans, are enough advanced that they do not need anything from Atlantis. Weir has already witnessed a giant city that far exceeds Atlantis in size and design. It is obvious that these are extremely advanced people. Weir soon learns from Niam that the Asurans can easily manufacture Z.P.M.s which are necessary to power Atlantis and its shield. Oberoth admits to powering their city with the Z.P.M. technology since they split from the Lanteans. In the hopes of obtaining a Z.P.M., Weir explains their struggle against the Wraith. Oberoth imperiously informs her that the Asurans will deal with the Wraith at a time of their choosing, without regard to the plight of Atlantis or any other Pegasus Galaxy inhabitants. Angered, Weir decides to terminate negotiations. But the group is suddenly surrounded and detained as they near the Stargate. They are imprisoned and interrogated. 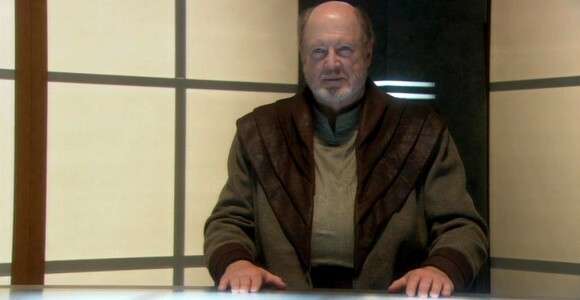 Oberoth wants information about the whereabouts and operations of Atlantis. The Asurans reveal themselves to be human-form Replicators who stick their hands in the heads of each team member to extract information. Like the human-form Replicators SG-1 have met (“Unnatural Selection”, “New Order”) the process is painful and involves realistic hallucinations to elicit information. Each team member has a different encounter. Rodney McKay realizes who and what the creatures are and informs the group. Oberoth has decided to terminate these Atlanteans, but Niam insists there is still much they can learn from them. Assuring his subordinate that their actions are not only Niam’s responsibility, Oberoth allows them to be freed. With no way to escape, the team is surprised when Niam arrives to offer a deal. The Asurans mimic their creators, the Ancients, so exactly that some want to achieve the same thing that the Ancients always sought: ascension. Since they were created to fight the Wraith, they have aggressive programming which Niam believes is the stumbling block to achieving true enlightenment. Worse, the Asurans do not possess the ability to reprogram their own base code — an Ancient fail-safe. With several fully-powered Z.P.M.s, Atlantis could fly and power its shield and engines. The Asuran city ship’s replica of the city separates from the umbilical arm and launches off the surface of the planet and into space. Oberoth intends to destroy Atlantis as a final retribution against the Ancients. Meanwhile, Niam takes Weir into an hallucination, explaining his people’s history. She learns that the Ancients created the machines to be a weapon against the Wraith. But eventually, the time came when the they decided to erase that mistake by raining fire upon the civilization via Ancient warships. The Replicators were left to die, but escaped annihilation — eventually evolving into the Asuran civilization over thousands of years. Niam asks McKay to reprogram him to be less aggressive in return for his actions to save the team and Atlantis. McKay agrees and manages to find the way to reprogram Niam, who will then update the others’ programming via the Asurans’ wireless network (much like the way modern Replicators communicate). However, the deception is discovered. But McKay has also found the means to temporarily “freeze” the Replicators who have not been updated. Weir orders McKay to destroy the city. Unfortunately the only way to do it quickly is to overload every Z.P.M., making it impossible to take any back to Atlantis. They steal a Puddle Jumper, just as the city explodes in Lantean orbit. Atlantis now faces and even greater threat than the Wraith: sophisticated, human-form Replicators, who are likely the most advanced and technologically powerful race in the galaxy. This revelation about the possible origin of the Replicators — at the hands of the Ancients — explains the answers to two nagging questions from Stargate SG-1 mythology. First, how did the spider-like Replicators, intelligent but made up of inch-long blocks, learn to create First (the first human-form Replicator made up of nanites) by simply studying the android Reese (SG-1: “Unnatural Selection”)? If nanite-based technology was their original form, it may well have been programmed in at a subconscious level. Second, it explains why the Ancient library of knowledge downloaded into Jack O’Neill’s brain happened to contain the schematics for a handy-dandy weapon capable of destroying a humanoid Replicator with a single shot, by disrupting the bond between the nanites. Clearly it was a technology with which the Ancients were quite familiar. After introducing the idea of an advanced antagonist in the Pegasus Galaxy in the Season One episode “Hot Zone,” the writers expressed a desire to revisit the mysterious creators of the nanite virus in Season Two, but didn’t get to it. According to executive producer Brad Wright, the Asurans will be a major recurring antagonist in the future of Stargate Atlantis — and were originally conceived of as the series’ primary villains when the show was on the drawing board. VOTE! How would you rate Atlantis's "Progeny?"